There has been a mill at Sonning for many centuries. In the Domesday Book of 1086, three mills at 'Sonninges and Berrochescire' are mentioned. The site of this earliest building could well have been in a different place. However, by the late 16th century, a milling complex on the mid-Thames island (actually in Oxfordshire) was certainly flourishing. In 1583, Richard Blunt, who was tenant of the Royal Manor at Sonning, leased the mill there to the aptly named Henry Milsam. The double-wheeled mill grinding both corn and malt must have been a profitable business even then, for though Blunt provided the miller with chalk and timber for any necessary repairs, the mere upkeep of the establish must have been quite a drain on resources. Milsam was to "maintain as well as the said mills, weirs, floodgates, bank, locks and other the premises at his cost. And so in the end of the said term to leave the same well and sufficiently repaired as well in timberwork, chalkwork and waterwork as otherwise in all manner needful reparations". In return, Blunt was given all the 'ground-birds' for which the miller received 11d apiece. Around 1600, the rents were returned once more to the Royal Revenue; and during the Civil War when King Charles’ supporters were under siege at Reading, it is said that it was Sonning Mill which smuggled flour to the Royal garrison in the town. "There are three water wheels and mills besides one mill which is used for grinding of coarse stuff when one of the other mills doth not go which belongs to Sonning Mills but the said four mills do not nor cannot go together. there is but one entire stream above the head of the mills but about four or five yards above the mills there is an arrow head about four or five yards in length in order to carry the water the sharper through the thoroughs of the mill for the service of two of these wheels and from the said arrow head the stream continues divided until it meets again below the tails of the said mill". His expenditure, at this time, for keeping the floodgates and 'engines' in repair was £60 pa, largely because of the increased use of large barges on the river (some up to 180 tons) which caused floods and other damage to the weirs so vital to mill operations. By 1761, one Robert Woodroffe, the son of the miller of Sherfield-on-Loddon in Hampshire, owned the lease on the mill. He also held an interest in the Bromley boat-building business and lived at 'the Rookery' (later 'the Manor House') in Sonning Village. During Robert's time, the mill buildings may have fallen into disrepair or, more likely, succumbed to a disastrous fire, for, in 1797, the Misses Rich undertook a major rebuilding project at a cost of £1,178 8s 6¾d. It was soon after this that the establishment was almost certainly purchased by Woodroffe's cousin, Mr. Thomas May, the miller of Brimpton, on behalf of his middle son, Daniel. At the age of only twenty-six, Daniel May began to build Sonning Mill up into a thriving business. The establishment sold corn in Henley and Reading, and sent produce further a-field on a fleet of barges. Its flour was popular in London as well as locally. In Daniel’s later years, the mill was managed by his son, Morgan, and finally, after over fifty years grinding corn at Sonning, Daniel died. For something under a year, Daniel's grandson, William Simonds Higgs May, tried his hand at running Sonning Mill; but perhaps it was not to his liking for, in 1852, the joint-heirs sold the business the Witherington family (into which William later married). Charles Witherington, followed by his son, Ilted, became a leading figures in the village for the next sixty years. They added the top two storeys to the mill and installed the larger waterwheels to provide more power to drive the machinery in 1894. Around 1898, they put in a steam engine to supplement the water power. The Phillimore family took over the mill in 1913, but they still traded under the name of C.H. Witherington and Sons Ltd. They remodelled the inside of the mill the following year. Up until 1950 the mill had its own fleet of barges which brought wheat from London right up to its door. In 1962, when the business was taken over by Associated British Foods Ltd., they remodelled yet again and introduced electric engines although the main source of power was still produced by the wheels. When the mill closed in 1969, it was one of the last flour mills on the Thames driven by wheels. The new port mill at Tilbury had opened and Sonning, being much smaller could not compete economically. Also, one of Sonning's major customers, Huntley and Palmers, had stopped making biscuits in Reading. The mill remained empty until 1977, and then the owners, Tim and Frank Richards, began converting it to The Mill to the building we see today, from an idea by Eileen Richards, and 'The Mill at Sonning' Theatre opened on July 22nd 1982. The Mill at Sonning continues to go from strength to strength thanks to its ever loyal staff and audience, having produced an abundance of plays and musicals. 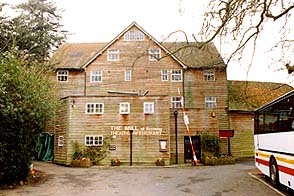 In 1984, The Mill At Sonning was given a conservation award by The Times newspaper and The Royal Institute of Chartered Surveyors for the design, restoration and conversion of the derelict mill into a dinner theatre, and recently was nominated Most Welcoming Theatre by the Theatre Managers Association.